The AAMC predicts a shortage of up to 104,900 physicians by 2030 and the outlook is just as dire for other health professions workforces. These positions will need to be filled by a diverse set of individuals to meet demand and establish a culturally competent health care workforce. But where will those individuals come from? At a congressional briefing on November 28 sponsored by the AAMC-led Health Professions and Nursing Education Coalition (HPNEC), representatives from Marshall University, Marquette University College of Nursing, and Georgetown University School of Medicine discussed how their institutions are responding to public health crises, building a pipeline of future health care professionals, addressing health inequities, and working to increase the supply, distribution, and diversity of the health care workforce. These institutions, along with many others, are funded by grants from the Health Resources and Services Administration (HRSA)’s Title VII health professions and Title VIII nursing workforce development programs. The goal of the HRSA Title VII and Title VIII workforce grant programs is to help develop the health professions workforce in order to meet patient needs. For patients at Georgetown University School of Medicine’s clinic in Northeast Washington, D.C., those needs were centered on decreasing access barriers that prevent vulnerable patients from accessing quality and culturally competent care. Yalda Jabbarpour, MD, discusses how HRSA Title VII and VIII programs help patients like Mary. 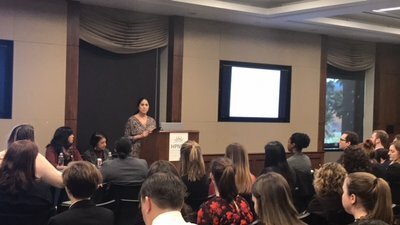 During the briefing, Yalda Jabbarpour, MD, assistant professor of family medicine at Georgetown University School of Medicine and director of ambulatory care, told an anecdote about Mary*, a clinic patient who Jabbarpour had seen while serving as a resident at Georgetown. She spoke about how a program funded by a Title VII Primary Care Training and Enhancement (PCTE) grant provided Mary with access to the health professionals and care team she needed. Mary was diagnosed with diabetes, was morbidly obese, lived in an area where it was difficult to buy affordable, quality (also known as a “food desert”), and was on ever-increasing amounts of insulin. In three years of individual visits, Jabbarpour had made only incremental progress in connecting with Mary and improving her health, despite every effort to break through a language barrier, and provide Mary with healthy eating tips and prescription coupons to make her insulin more affordable. With the help of the Title VII PCTE grant, Georgetown established a program consisting of group visits for patients with diabetes that was run by a resident fluent in Spanish. During these group visits, patients could discuss health related issues they had in common—including social determinants of health that exacerbated their conditions—receive advice from their peers on ways to deal with those issues, and exchange tips other patients found helpful in managing their conditions. “I learned more about Mary in that one hour than I had in the previous three years of visits,” Jabbarpour said about having sat in on one such group visit. Mary found a fellow patient in the group who could drive her to a grocery store after she shared that she lived in a food desert and was unable to easily access fresh and healthy foods. That same patient planned to meet Mary at the National Arboretum, where the pair could walk and get exercise in an area where they felt safe. The two also agreed to cook together to ensure they were eating healthfully, and other patients provided Mary with information on how to inject her insulin with limited pain. While Jabbarpour believed Mary had previously not complied with her diabetes medication because it was too expensive, during the group visit, Mary admitted she had a fear of needles, which kept her from taking her insulin. After returning to Georgetown, and beginning work on a new Title VII grant, Jabbarpour heard from a current resident that Mary was still attending the group, had gotten her diabetes under control, and was managing her weight. Jabbarpour attributes this patient’s success to the group visits Mary and her peers attended, which allowed Mary to open up and communicate many of the issues she may have felt uncomfortable discussing with her doctor. Much like providing Mary and her fellow group members with the professionals and care they needed, Title VII grants allow providers in rural areas to respond to the opioid and substance use epidemics in ways that is tailored to their patients, including those who are low-income, homeless, or at risk of becoming homeless. Marianna Footo-Linz, PhD, presents at the briefing. Marianna Footo-Linz, PhD, chair of the Department of Psychology at Marshall University, located in Huntington, W.V., discussed how a Title VII Behavioral Health Workforce Education and Training (BHWET) grant and a Title VII Graduate Psychology Education (GPE) grant have allowed Marshall to support clinical internships and placements for students. This support helps Marshall place students in settings where mental and behavioral health care is integrated into primary care, and many of these placements are in HRSA-designated health professions shortage areas, some with very few or no psychologists. Graduates of Marshall’s program have gone on to accept and train students themselves, including at Federally Qualified Health Centers (FQHCs) in McDowell County, one of the epicenters of the opioid epidemic, and in family practice settings where students provide medically assisted treatment to expectant mothers. Increasing access to care by providing the right type of care in the most beneficial setting, as Georgetown and Marshall did through their HRSA-funded programs, is key to generating positive outcomes for patients. Ensuring that patients are served by a diverse, culturally competent workforce is also critical. A program at Marquette College of Nursing seeks to meet the need for a diverse nursing workforce by recruiting and retaining individuals from underrepresented backgrounds, many of whom are first generation college students. The program, Project BEYOND-2, provides support through advising and mentoring, scholarships, structured programming, and outreach for students completing their Bachelor of Science in Nursing (BSN) degrees. The program receives funding from a Nursing Workforce Diversity grant. Juanita Garcia, MEd, RN, PhD, Project BEYOND-2 coordinator at Marquette University College of Nursing, and a first generation college graduate, noted that while she had taken the “scenic route” to graduation, Project BEYOND-2 provides the support students need to take a more direct path through their education and on to serving patients. Garcia also discussed the benefit of the program not only to patients in the area around Marquette, but nationally. “An increasingly diverse nursing workforce is needed to meet the needs of an ever increasingly diverse population,” she said. “Supporting the next generation of nurses is crucial. Our country needs their expertise in a variety of clinical settings,” she added. Garcia also highlighted the importance of a diverse health care workforce when addressing health inequities. 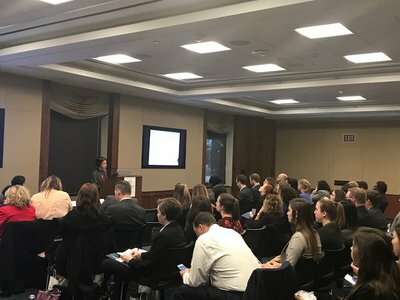 Some lawmakers have called for cuts to the HRSA Title VII and Title VIII programs, which also fund workforce development efforts in geriatrics and the oral health workforce, scholarships for disadvantaged students, and the Health Careers Opportunity Program (HCOP), among other initiatives. In his FY18 budget proposal, the President suggested cuts to many of the Title VII and Title VIII programs. While House appropriators proposed cuts to several of the workforce programs in their Labor, Health and Human Services, Education and Related Agencies bill, the Senate has proposed to fully fund the programs at their FY 17 enacted levels.. Despite these proposals, HPNEC has called for $580 million for Title VII and VIII programs, an increase of $42 million over FY17 levels, to continue this important work. In addition to concerns over the Title VII and VIII budgets, the programs also need to be reauthorized. Legislation has been introduced in the House to accomplish this—H.R. 3728, the “EMPOWER Act,” for Title VII, and H.R. 959 for Title VIII.